I am posting this to refute accusations that David Berg was antisemitic. The following article is a compilation from David's writings in 1972 and 1973. What he said certainly proves without a doubt in my mind that he was not antisemitic nor a Holocaust denier. He pitied the poor innocent Jews who fell victim to Hitler and his henchmen. There are a number of similarities between the rise of Nitler (David's nickname for Richard M. Nixon) and his Nitzies and the rise of Hitler and his Nazis, his prototypes: I was impressed by this through a documentary I had seen the night before on Hitler's dealings with the Jews in his rise to power prior to and during World War II, and I remember much of this myself, as I was a teenager at the time and an avid student of contemporary events, particularly as Hitler was posing a threat to the whole world, as well as to the Jews! The founder of Communism itself, of course, was a German Jew, Karl Marx, and many of its leaders, both in America and in Germany, as well as Russia, were idealistic, socialistic, Jews. During the Great Depression and Pre-War days of the 1930s, Germany, like America, tottered on the brink of Communism. America was saved from total Communism by a socialistic, dictatorial, pro-Communist president, Franklin Delano Roosevelt, himself suspected of being of Jewish lineage. Germany, however, was saved from Communism by a rise of the hard right, rich-backed, militant, radical, reactionary and fanatical Nazis under the leadership of Hitler, a rabid anti-Semitist. He used the Jews as a scapegoat upon whom he could blame all of Germany's troubles, accusing them of being the Communist enemies of the State. Many of them were Communists and leaders of Communism and their influence had been fairly strong and their leadership prominent, so they were a likely target for his bitter anti-Communist propaganda. His maniacal tirades against the Jews as being to blame for all Germany's ills soon whipped the poor German people into a frenzy of reaction against them, resulting in all kinds of discrimination and persecution. Signs barred Jews from many places of business, and a campaign of vilification and contempt was heaped upon them. They were prejudiced against in the courts, and harassed by Hitler's police, his private militia, the Storm Troopers of his Nazi Party of radical, Rightist reactionaries. Soon Hitler was able to make their persecution more official: Since he claimed they were not Germans but they were Communist enemies of the State they no longer deserved the protection of the police, since he accused them of not only being no longer German citizens, but enemies. This permitted the German Rightists to destroy their places of business, persecute, beat, and even kill Jews, without fear of retaliation by the police. 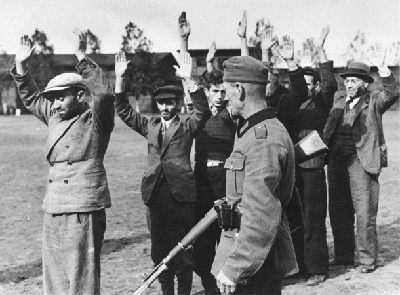 They had already been barred from many kinds of employment considered important to German culture or security, ineligible for Government welfare, and their books and papers and literature banned and burned. Then the threat of war gave Hitler and his terrorists the excuse they needed to convince the German people that the Jews should be rounded up into concentration camps as a serious threat to national security, the same way America rounded up the Japanese and put them in concentration camps in the United State during World War II, claiming it was not only for the protection of the Nation but for their own protection. Their property was confiscated in the name of the State, and in these concentration camps Hitler began the secret extermination of the Jews by highly scientific and intelligent methods of mass murder. It eventually became so patriotic to kill Jews that, for example, Hitler's henchman in the Nazi-conquered Poland apologised for being so slow at the job because there were so many of them there--about 3-1/2 million! You may say that it's almost unbelievable that a nation as civilised, intellectual, highly educated, scientific, and advanced as Germany could ever be guilty of such horrible atrocities against a helpless minority of its own people who had lived there for generations and consider themselves as Germans in all walks of life! But the most highly educated and so-called most advanced civilisation on the face of the Earth became the most bestial and barbaric in its reign of terror against this pitiful minority of its own people just because a fanatical and persuasive orator convinced the Germans that the Jews were their deadly enemies and a terrible danger to their country! Did you know there are Germans who still refuse to believe that Hitler was slaughtering millions of Jews, and he went clear through the war and most of the German people didn't know it? His security was so tight and his control of the news media was so tight that the German people themselves, the vast majority of Germans, knew nothing about the way these Jews were being absolutely annihilated. They knew they had concentration camps for Jews because Hitler put them there to protect the nation and protect the Jews from the nation. But what they didn't know was that they were systematically annihilating them in those concentration camps. Only a few people who were within knew it. There is a famous true story of one incident where a Nazi officer's wife boarded by accident a German-Jewish train loaded with German Jews who were being taken to a concentration camp. She was horrified when she discovered where she was, who these people were and where they were going. They were going by the thousands to this concentration camp. The security was so tight that since this was a train going there for annihilation, she was forced to go right along with them. This is a known case. She was gassed with all the rest of them lest she get out and let it be known. Well, that's security!! The German people didn't even know what was happening. Up until the very end of the war they thought they were winning it because that's what Hitler told them. That's how well a dictator can control the news media and thereby control the people.